A classic knife design got that way because it has been proven to work. 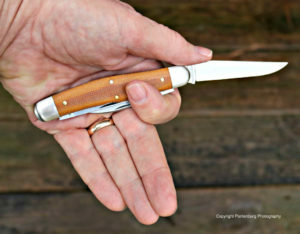 This Great Eastern Cutlery stockman may be the everyday carry knife you’ve been looking for. DISCLAIMER: Knivesshipfree.com and DLT Trading are Survival Common Sense sponsors. I did not get a free knife to review, and nobody had any input into this post. All the opinions expressed are my own, and all I ever promise in a review is a fair shake. Want to see if a knife is used? Then check out what a working person carries in their pockets. 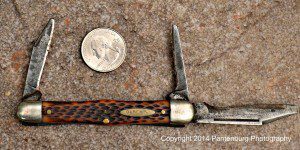 The three blade Stockman pattern slipjoint is a time tested and proven pocketknife. My dad, a carpenter and farmer, carried a wallet, handkerchief, loose coins, Zippo lighter and a stockman pocket knife in his pockets. It didn’t matter if he was going to church, was on a construction job or working in the fields, this combination went along, and the items got used frequently. In high school, I also carried a stockman pocket knife. At Gilbert High School, in Gilbert, Iowa, most of the students were farm kids. Many of us went home from school to do evening chores. In my case, I hurried through feeding hogs and cattle so I could go hunting. My stockman might be used to cut twine on hay bales and open sacks of feed. If I was successful and brought home squirrels, rabbits pheasants or quail, the Stockman (blades properly washed and cleaned) would be used to process the game. The stockman did everything I needed a knife for. 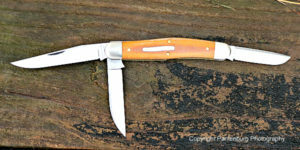 So the Dixie Stockman, made by Great Eastern Cutlery, was an easy sell to me. At 4 1/8″ closed, this profile features a large ‘muskrat’ clip-point, a small ‘sheepscliffe’ secondary, and a spey blade. First impressions out of the box were great. The finish is excellent, and you can’t run a finger over the knife and tell where the micatra stops and the metal starts. The blades all fit just where they’re supposed to and the slip joints “Walk and Talk” nicely. The blades open easily, and lock into place with a reassuring click. There is not a halfway click when a blade is opened. The 4-1/8 inch handle fits my large hands well. Steel: 1095 carbon steel used to be the standard by which other steels were measured. Then the super steels came along and we all thought our knives had to have them. Since I’m OCD about sharpening knives and cleaning firearms, I never had a problem with 1095 dull blades. I compulsively maintain blades, and the 1095 holds an edge just fine. Handle: Working knives should be made of micarta. The material is indestructible and looks and wears well. That said, several of my hard use hunting knives have wooden handles. My Dixie has natural micarta handles, since it won’t be a safe queen. Micarta gets tacky when damp, and this is a good thing for a handle that could get wet while being used. Blade configurations: This is where the stockman shines. The three blade designs can cover just about everything. Muskrat clip point: I didn’t do any trapping, but some of the kids I went to school with ran trap lines along the Squaw Creek or Skunk River. The clip point was originally designed to skin muskrats and other fur bearing animals. I presume its effectiveness has been proven – this design goes back at least 100 years. I used the clip point on everything, particularly cutting twine. The clip point was just right for gutting birds. Spey blade: This was my small game blade. It was short and sharp and just right for rabbits and squirrels. Most of the time, the hides could just be pulled off, but the occasional old, tough squirrel might have to be skinned. The Dixie spey blade has a nice belly on it, and it will work really well on small game. Sheepscliffe: Probably the most used blade on my knife was the Sheepscliffe. I kept the other two blades sharp for their hunting duties, but used the sheepscliffe for everything. It cut twine and feed sacks very effectively, and was easy to re-sharpen. This was my dad’s knife, and it was in his pocket on the day he died. Size: The Dixie has a 4-1/8-inch handle which fits my large hands well. It is not so big as to be too bulky in your pocket. Made in the USA: Great Eastern Cutlery is made in Titusville, Pennsylvania. The craftspeople pay local, state and federal taxes, and contribute to their local economies and communities. Support small business and buy American! ALL knife reviews are subjective, and these are opinions. As such, take them with a grain of salt. Carbon steel can rust: Put this knife away wet and it will most likely rust overnight. In particularly humid areas, rust may develop quicker. If rusting is a concern, don’t get carbon steel. That said, I use carbon steel knives in Mississippi, where the humidity and heat are extreme. Wipe off the blades after using, and put some mineral oil on them and there shouldn’t be any problems. 1095 will not stay shiny: If a mirror finish is the goal, invest in a stainless steel knife. Carbon steel will develop a patina that I find attractive. It is not a lockblade: I don’t trust locks on knife blades or safetys on firearms. The best advice is to use any pocket knife as if it were a slipjoint. ORDER A DIXIE STOCKMAN HERE.